Well Happy Monday to everyone! Mine turned out happier and much more productive than I could have ever imagined and here I am actually writing a blog post on a Monday. Hot Damn! 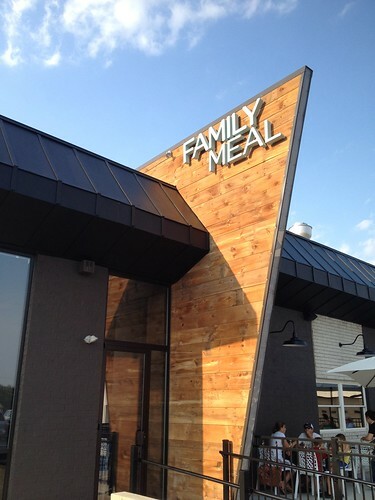 So aren’t I a lucky girl to live within walking distance of the new Volt restaurant (actually diner…)- Family Meal. And I have been there two times already! I slowly watched this old car dealership be transformed into a really cool space over the past 7 months. It has been awesome. Bryan Voltaggio is so dedicated to his hometown of Frederick and that is shining through more and more with everything he does. I had a nice date night with a man I would like to affectionately call J-dogg on a Saturday night and I took the Abuelitos for an early Sunday Supper yesterday! Go for the jump to see my iPhone pictures which turned out great. 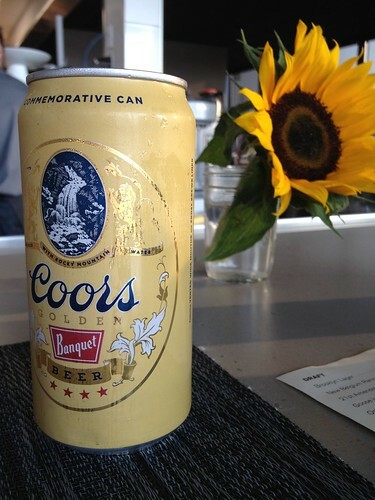 I started out my date with a round of Coors Banquet. 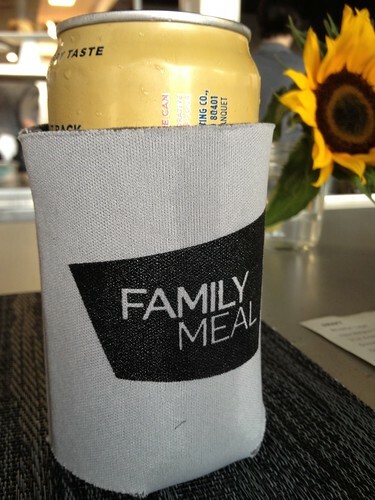 $2 cans of beer here people. Has anyone ever heard of such a beverage? Not me, but it was pretty hilarious. While sitting at the bar waiting for our table, we got to talking to the nice pastry chef. 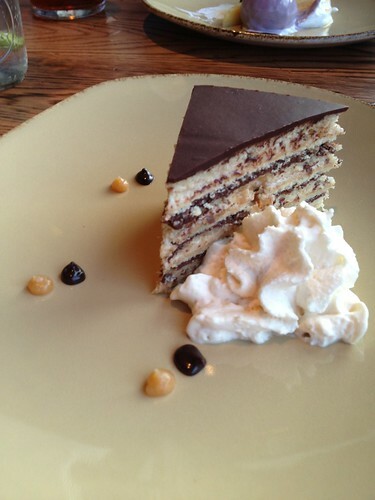 I took one look at the Smith Island Cake and postured- is that opera cake? He was impressed by my confectionary knowledge and it made me amused. See that cake below! Once we got seated, we went for one of the appetizers. 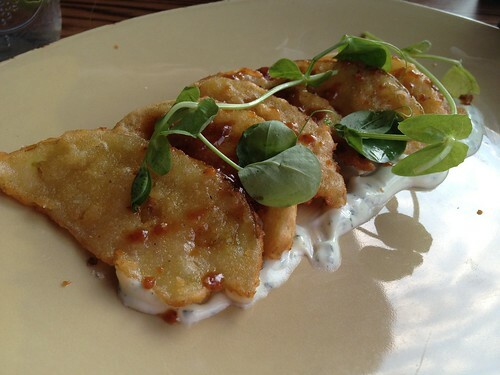 Since I am so in love with the fried green tomatoes at Miss Shirley’s, I was excited to see Bryan’s version. Well, there were definitely more “fried” than I had ever had. They were almost thin enough to be kind of chip like. They topped that with pea shoots and a bacon jam. Deeelish. 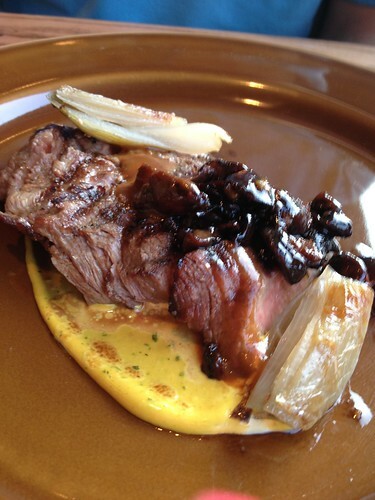 J-Dogg got the flat iron steak which came with frites, marinated mushrooms, shallots and a bearnaise sauce. It was a perfect man meal. The steak was cooked nicely and the mustardy sauce had good flavor. 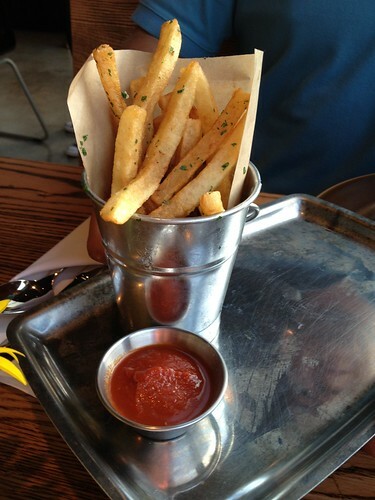 And frites! I should have tried one.. dumbbbbb. 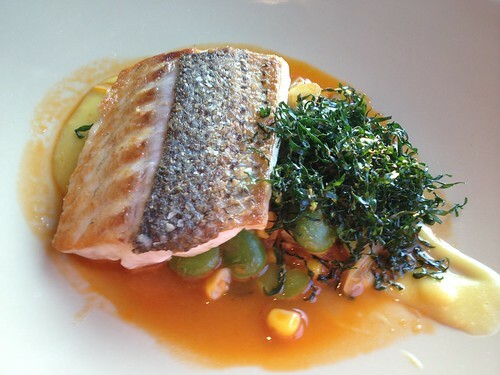 I got the rockfish, which came on a bed of corn puree with some chorizo sauce and fresh corn and fava beans and with a crispy collard green garnish. I looooooved it. The corn puree tasted great, but I anticipated the chorizo sauce to be more flavorful. The fish was cooked perfectly and the collard greens were kinda fun. Abuelito got the same thing when they came with me, and his was salmon, but he loved it also. 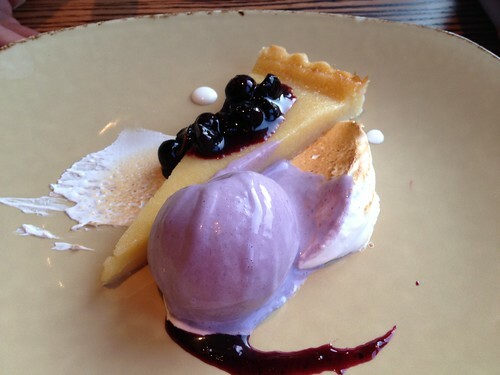 And then it was on to dessert, J got the lemon meringue tart with fresh blueberry sauce, blueberry ice cream, and a toasted swipe of meringue. OMG yum. I just haaaaad to get the “Smith Island” cake. It had layers of heath bar, cinnamon and espresso. My kinda cake! Served with some whipped cream. I was in heaven. It was pretty rich too so I took some time to savor it. So that was meal #1. Very nice waitress and I loved the country music that added to the low key ambiance. For meal #2, Abuelito started off with the wedge salad. Now he is on Coumadin to thin his blood, so he has to stay away from the leafy greens. When I thought of wedge, I thought of iceberg and there was not much iceberg! Bibb lettuce came instead! 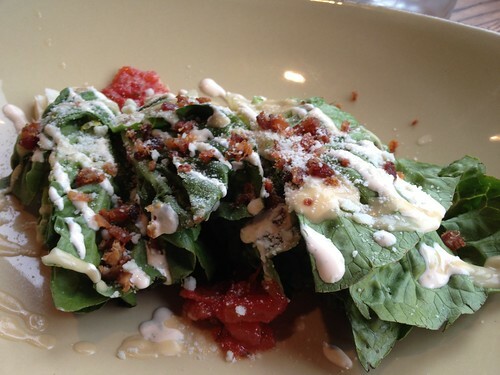 He ate his good share of the tomatoes, bacon and dressing and I ate the remaining greeny greens. Pretty much a standard delicious salad of the like. Abuelita’s stomach was a little off so she thought the chicken soup might do her good. The only problem was that this chicken soup was 100% unlike what she makes! This is a problem with ordering foods that are so near and dear to your heart when it comes to the homemade version. 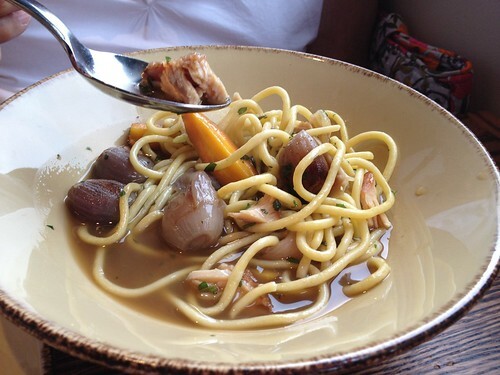 This one had spaghetti noodles, roasted chicken, carrots and shallots. Grandma remarked that the broth did not taste like chicken had actually been cooked in it. Maybe it was like a consomme kind of broth? Either way she was not a fan. I was happy with my soup though. 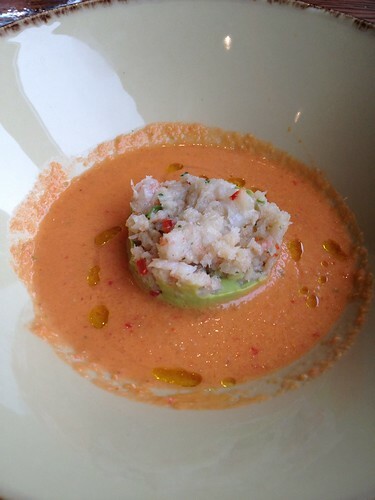 A very rich gazpacho with a shrimp and avocado topping. Wish the soup part had had more of a serving to it. Very flavorful and kind of unlike what I have made myself. It was definitely more dense than the version I make. 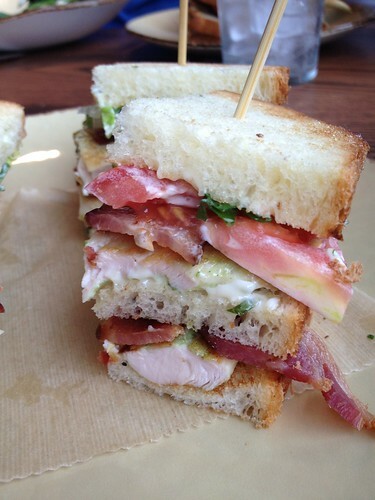 As I said, Abuelito got the salmon, but Abuelita and I got the chicken club sandwiches. The bacon was nice and thick, the tomatoes nice and juicy and the chicken had the perfect thickness. Oh and the aioli was soooo tasty, but the bread was kind of stale-ish, so it gave both of us no real reason to eat the crust ends of each bite. Ah you win some you lose some! Abuelita remarked that this restaurant just needs some more time to get acclimated. Our waitress this time was pretty lax and we wished she had been a bit more attentive to the table. But c’est la vie. This total came out to be $68, which is pretty pricey for diner food. But it is gooooood diner food. This is definitely a good way to access Bryan’s great food, if you aren’t in the mood for sandwiches like at Lunchbox, but I wouldn’t say this place is perfect yet. 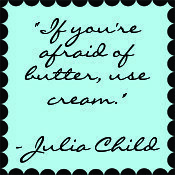 You will have to try for yourself! Oooh, that looks great for Friday evening and a glass of wine. Thanks!